Alex Rodriguez, a.k.a. 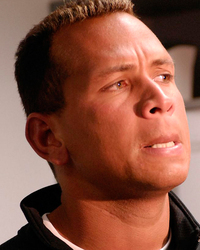 A-Rod, was born on July 27, 1975 in New York and spent his childhood in the Dominican Republic and Miami. He is known for his baseball career as the New York Yankees’ third baseman. He won one World Series title in the pinstripes in 2009 and retired from the sport in August 2016 after over 22 years with 696 home runs. Rodriguez was involved in a steroid scandal and was suspended for the entire 2014 season and was penalized with a cut in his salary. Since leaving the clubhouse, Rodriguez has traded his cleats for a mic in the broadcasting booth as a MLB analyst for FOX. A-Rod is just as famous off the field as he is on. He was married to ex-wife Cynthia from 2002-2008. She alleged Rodriguez was not faithful. The former couple share children Natasha and Ella. The athlete has dated the likes of Cameron Diaz, Kate Hudson, Madonna, and Jennifer Lopez. World Series Ring Nearly Upstages Proposal!!! J. Lo & A-Rod Are Engaged!